Tomorrow is Batman Day, the day DC Entertainment established in 2014 as part of the company’s celebration of Batman’s 75th anniversary. [extreme tim curry in clue voice] I know because I was there. The day has persisted over the years because…well…he’s Batman. Similar days have been marked for Superman and last year Wonder Woman entered the mix thanks to the combination of both her big screen solo adventure and the character’s own 75th anniversary. 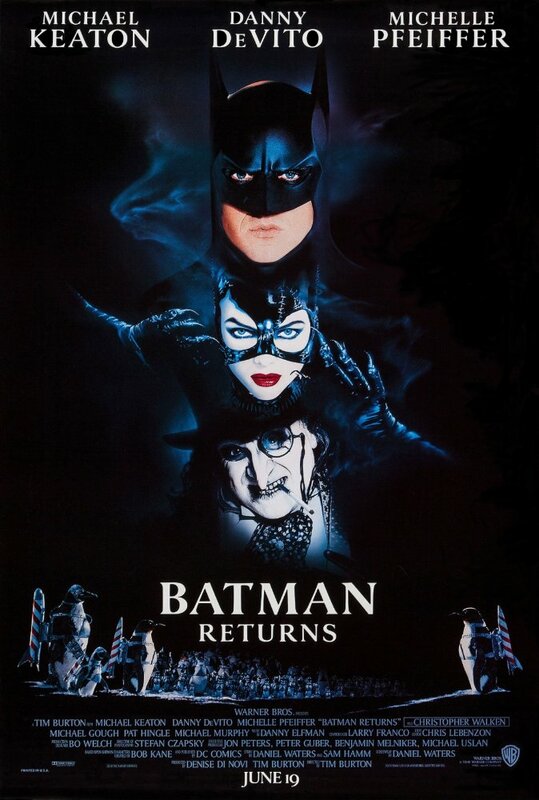 To celebrate both tomorrow’s pop culture holiday and the recently-passed 25th anniversary of its release, today we’re going to turn our attention to one of my favorite movies starring The Dark Knight, 1992’s Batman Returns. The sequel to the 1989 blockbuster brought back the powerhouse combination of director Tim Burton and star Michael Keaton. In the story, Batman is now well-established in Gotham City. That’s good because the city faces a new threat in the form of Oswald Cobblepot (Danny DeVito), who was abandoned by his wealthy parents as a toddler because his birth defects were too much for them and their haughty lifestyle. Now grown, Cobblebot positions himself as the returning prodigal, anxious help the city and run for mayor. That bid is just a cover, though, for his more devious plans to exact revenge. At the same time, Selina Kyle (Michelle Pfeiffer), has evolved into a feline-inspired symbol of feminine power after she was killed by her boss Max Shreck (Christoper Walken) and revived by a group of stray cats. While Batman takes on The Penguin, Bruce Wayne begins a flirtatious affair with Kyle until it all comes crashing together at the end. When I walked out of the movie I turned to my friend Todd and said “Wow…Tim Burton really loves directing snow,” a reference not only to its use in this film but also Edward Scissorhands. In fact, the movie plays much more like what at the time was considered a Tim Burton Film than a Batman movie. With themes touching on the place of outcasts in society, a blue/gray color palette and explorations as to the duality of the human mind, it fits much more neatly with the director’s overall work than the first Batman, which by contrast seems like well-made if slightly generic studio film. The teaser poster is an amazing piece of promotional artwork. 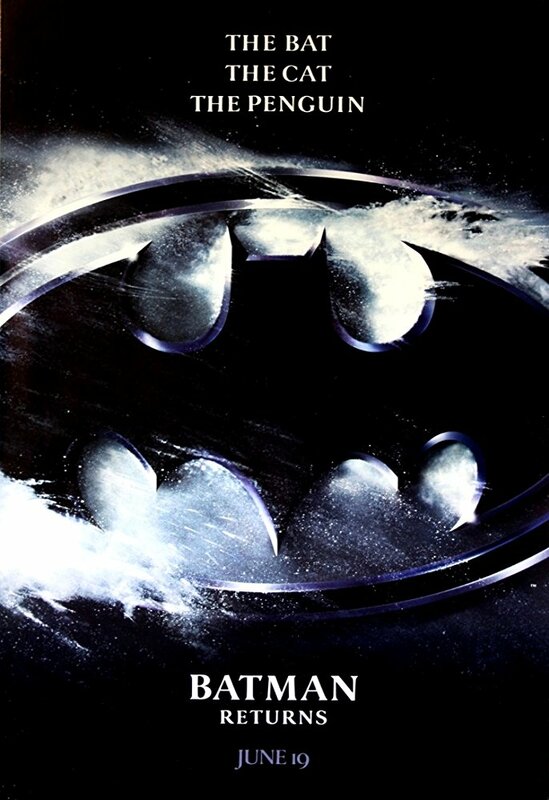 Like the iconic poster for the first film, the primary element is the Bat symbol that bleeds out over the sides of the frame. Instead of the bright yellow and dark black of the first one, this one is covered in windswept snow, showing audiences what the tone of the movie was going to be. The expanded character list isn’t named but only referenced with copy at the top reading “The Bat. The Cat. The Penguin.” It’s simple and it’s stunning, showing the restrained colors that would dominate the movie and telling audiences what they could expect to see. The theatrical one-sheet arranges the faces in the same order as they were previously listed, with Batman followed by Catwoman followed by Penguin. That allowed a good look at just the kind of characters we were going to be following and clearly signaled to anyone well-versed in Burton’s style that his design aesthetic would be well-represented in the character designs. Catwoman looks fierce in her obviously homemade costume while Penguin looks grotesque, like a twisted version of a fairy tale character. Some of the story, but not much, is conveyed at the bottom with a scene showing dozens of penguins huddled around, all with brightly-colored rockets strapped to their backs. Again, the contrast of the dark scene and the pops of red show that Burton’s unique visuals would dominate the movie. The trailer opens with Penguin plotting his return to Gotham as we see him walking through the sewers he’s made his home since his exile. Then we see Selina become Catwoman in the wake of her death, becoming an empowered anti-hero. Batman is then the only hope for the city, but he’s consumed with feelings for Catwoman. We see Penguin executing his plans and Batman taking on the circus gang that’s part of that. There are shots of the Batmobile, the Bat-boat and just of Batman punching his way through the guys. What comes through here is the focus on the villains the movie would take. Penguin and Catwoman are positioned in the trailer as the ones driving the story and whose journeys we’ll be following. Batman is the hero, yes, but he’s seen here as almost a side character who’s only interesting as he relates to the other two. That’s…well, it’s not exactly accurate because Bruce Wayne plays a big part in the stories of both characters, one that’s bigger than what he does as Batman, but we don’t see that here. Instead we’re focusing on the twisted personalities that drive Batman’s adversaries. That, on the other hand, is pretty accurate to the movie that’s being sold. Burton, in his second outing, was not able to more fully integrate his design sense but also give outlet to his love of the outsiders, the characters shunned by society because of their differences. It’s that message that’s sold loudly and strongly in the trailer, that we’ll be watching a Tim Burton film with comic book characters as the medium for his worldview. While the campaign may not get that deep, it does present the movie as both an action-filled blockbuster and a study of characters who all walk the line between the light and the dark. Tagged: batman returns, danny devito, michael keaton, michelle pfieffer, tim burton, warner bros.
Next Picking Up the Spare: The LEGO Ninjago Movie, Brad’s Status, mother!